When I was very little, my grandparents bought me a copy of “One Thousand and One Nights“, in a version that (at the time) seemed to me quite appropriate for my age (I must have been about 8). Among the stories that I enjoyed the most was that of Aladdin and his magic lamp. Said magic lamp housed a genie with special powers. 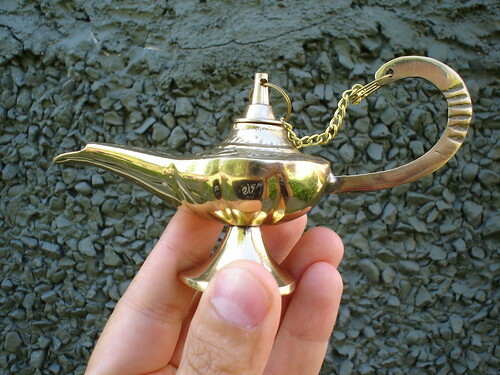 The genie was able to grant wishes (traditionally, in Western cultures, a maximum of three). At the tender age of 8, I wished I was a genie able to grant more wishes, but I struggled to find EXACTLY which three wishes I should grant (or I should ask for, if I ever met a genie). Well, recently I was kindly granted Genie status by the good folks of DreamBank. Along with my beautiful lamp, I was also given a $20 voucher that I can put towards a DreamBank dream. Just in the same way as I struggled when I was 8 years old on which wishes should I grant, I had been struggling for the past few days with which dreamer’s dream to support with my voucher, and even more so, which dream to go for (which is why this post is SO terribly late). When I entered my PhD, I figured that the one wish I wanted would be to help save the environment through my research. That wish has, in a way, been granted already by the Powers-That-Be, since my research projects have helped environmental non-governmental organizations design better campaigns, local municipalities have benefited from my studies on wastewater governance and policy, and I’ve sat on numerous national and international committees on environmental policy, contributing whatever little I know about these issues. So, in a way, I figured it was time to be slightly more self-centered and focus on which wish I wanted granted. And here is where DreamBank is a great opportunity to kill two hummingbirds with one stone (hat tips to John Biehler for the phrase). - Your dream, however selfish it may sound, helps fund charitable causes. - The notion of communities of dreamers helps also create relationships and bonds that may last for a very long time. - Some of the fellow dreamers in Vancouver include good friends of mine, like Beth Snow and Rebecca Bollwitt, just to mention a couple (Editor’s note – I have the feeling that my mentor and friend DaveO might have also been granted genie status, I don’t know why but I have this feeling – he should be, as he is an inspiration to us bloggers in Vancouver). - DreamBank is very transparent about their business model [DreamBank Accountability page] (yes, they are not a non-profit, but the side effect of funding a Dreamer’s dream does bring collateral benefits). As someone who does actually do research on accountability and transparency (I have a journal article forthcoming this year on this very topic), these are two elements I always watch for. - The fine print is actually published as The Large Print (giggles). You can check a list of the dreamers, and yes you will find me there. I just recently (as in, within the last 24 hours) decided what my dream would be. Despite the conversations I might have had with my fellow bloggers, no, my dream is not paying my student loans (which would be nice), and it’s not going to Paris for six months for a research stay (which would also be nice). It’s a smaller dream and one that actually I think would benefit my readers, my fellow bloggers, the local Vancouver community and the environmental research community at large. I haven’t inserted it yet on my Dreamer page, but my dream is to buy a new laptop, actually a MacBook. . And since my birthday is coming up (September 19th), I think I got enough time to achieve my dream. At least, I surely hope so! Which charity are you choosing to support through your dream, Dr. R? @ Dr. Beth – One thing at a time! I settled on my dream, I just need to decide on the charity AND the recipient of my $20. Hmmm… I really like the project in Uganda led by Dr. Erin Baines, from the Liu Institute of Global Issues. I might go for that one Thanks for the reminder! Thanks for the great writeup, Raul!